The Cataloft Villa is located in the upstairs of our Club House building. Our Cat Villas are large, each one is a separate room custom made from floor to ceiling with multiple levels for our frisky feline friends to play. We also offer ex-large size for multiple family pets to bunk together. We have 5 inside villas with a view of the front field and 4 in/out Villas facing the Hillside. Four of our Villas have full access in/out to an attached outside enclosure through a cat door in their window for bird watching, sunbathing, lounging and more activity. We also have bird feeders on the hillside that attract many birds for our feline guest to watch. Our Facility is climate controlled with AC and Heat. We have a full back up generator for emergencies and every room is connected to our smoke and fire alarm system. We never put cats together that do not live together. Owners are required to bring their pet’s food. We provide the litter. 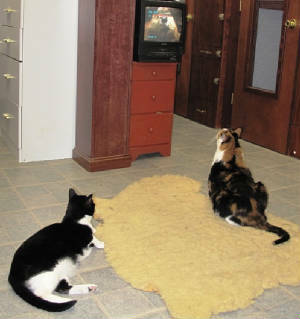 Several times a week, we play nature videos for our kitty friends that seem interested. Naturally there is endless playtime in the enclosed Villas but “Playtime” as described here is an additional service. It is for one on one time playing with a person, petting, brushing, lounging in the chair to watch a nature video or freely exploring the room. You can see a few more photos on the playtime photo page. Special playtime is available for your pets and special visits with k-9 friends can be arranged, if desired.